WASHINGTON, Jan. 28, 2019 – The U.S. Department of Agriculture (USDA) has extended early bird registration rates for the 2019 Agricultural Outlook Forum (AOF) until Feb. 6. 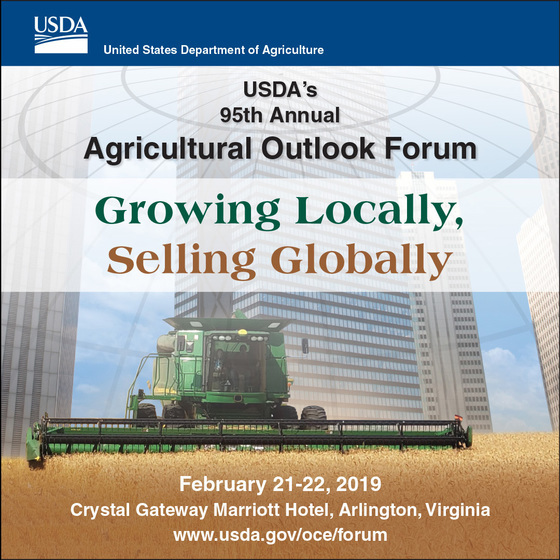 The forum, the largest annual meeting of USDA, will take place on Feb. 21-22, 2019, at the Crystal Gateway Marriott Hotel in Arlington, Va. This year’s forum, themed “Growing Locally, Selling Globally,” highlights current issues and trends affecting agricultural production and global markets. The forum’s sessions will explore topics such as global trade trends, innovations in agriculture, developments in animal and crop biotechnology, frontiers in conservation, and outlooks for food and commodity markets. An exhibit hall will showcase resources from USDA agencies and private organizations. Last year, nearly 1,600 stakeholders attended the forum. Register for the 2019 Agricultural Outlook Forum. Follow the conversation at #AgOutlook on USDA’s Twitter, Instagram and Facebook.